The idea of ​​a heated floor is not an invention of today. It was used by the ancient Romans when they built their luxurious baths. And today we are happy to go barefoot on a warm laminate or tile, heated by one of two options - either using a hot water pipe system or electricity. Well, what kind of warm floor is better - easier to install, more economical, more convenient to use - the answers in our material. It is common to both systems that they are hidden under the floor covering, without having direct contact with the air of the room. So no convection, accompanied by raising dust, can not occur. Due to this, the air is not too dry, as is the case with the use of floor heaters. Water-heated floors are chosen by many because of their low cost of operation. After all, they do not consume electricity, but connect to the general heating system at home. That's the way it is, but when they work, energy consumption increases (usually gas), and a low-power boiler may not cope with the load, moreover, the boiler must be automatic. This boiler has to be changed by buying a more powerful, modern model. We also take into account the gas costs, so that saving (compared to the floor of the electric type) is obtained only by heating large rooms. Naturally, it occurred to many that it would be easier and more profitable to connect a hot-water floor in a city apartment with central heating. As a result, there will be no extra expenses - beauty! This was not the case - such naive people were very mistaken when they installed such systems. It turned out that the money was thrown to the wind. And all because it is strictly forbidden in houses with central heating to connect to them a warm floor. For this, the penalty is also considerable. Water-heated floor heating made of metal-based laminate. 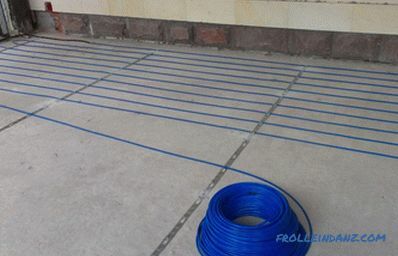 In order to make a final decision on which heated floor is better - electric or water, it is necessary to take a closer look at the structures that run on electricity. 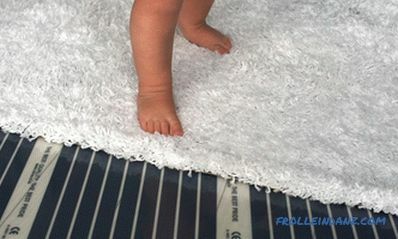 There are several varieties: cable system, infrared floor and mini mats system. # 1. Cable floor heating. 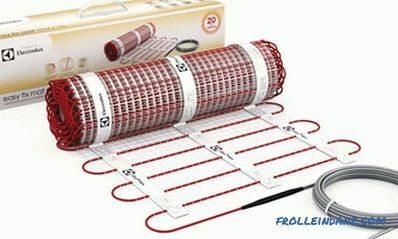 This type of “underfloor” heating is a cable system. They consist of separate sections, each of which, in turn, is represented by a shielded cable (with one or two conductors) in two-layer insulation. Cables are interconnected by reliable sealed couplings. All these precautions make the heating system absolutely safe, even in areas where it is very damp. Such a system is economical - for different rooms you can choose different power of the cable used. After all, the kitchen or in the corridor does not need a floor with a capacity of 150 to 180 watts per square meter, as for rooms that are not heated (for example, loggias, balconies). The kitchen floor will have enough power of 120 watts per square meter, and for the bathroom - 140 watts per square meter. "Cable" floors - the cheapest of all those who work on electricity. But they need a coupler - this is a prerequisite. Because of her, the height of the floor increases. 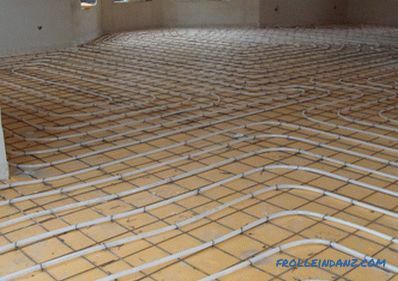 Installation of a cable heat-insulated floor. # 2. What are heating mats. The so-called cable system is also called, only very thin (3 millimeters or less). 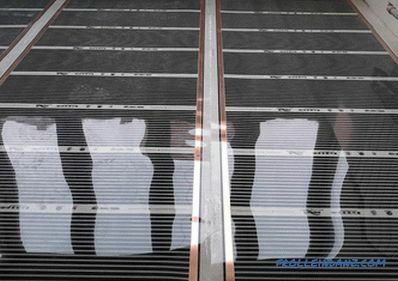 They are fixed on a fiberglass mesh, sold in rolls that look very similar to mats or floor mats. Therefore, they were called minimats. 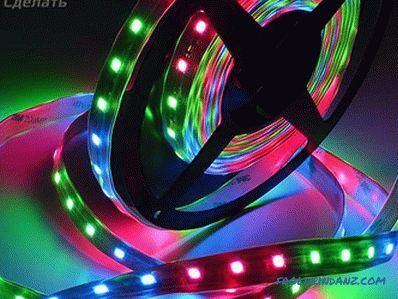 They are extremely quickly mounted - it is enough just to roll out such a roll on the base, and then connect the cable to a sub-box equipped with a temperature controller. This type is considered the best floor heating under the tile. After all, tile coating can be glued directly to the minima. # 3. Infrared floor heating. If we use a special infrared film instead of cables, we get an infrared floor. It also works from electric current, it can even be installed under a carpet or under a laminate, it does not need a concrete screed. Moreover, it is quite possible to mount it almost instantly - in just a couple of hours. And then you can immediately turn on and use, since there is no need to wait until the glue hardens, or the cement grabs. This type of "heating" floors is good in that there is absolutely no dirt or dust during installation. Therefore, it is quite possible to mount it when the apartment shines with a brand-new renovation - nothing spoils and does not get dirty. Moreover, the infrared film can be laid not only on the floor, but also on the walls. If you want, you can even heat the ceiling in the country. If, of course, the price does not scare you away - carbon film is not cheap. If the area of ​​the house is large (more than 60 square meters), then it is advantageous to use the floor of water type economically. Such a system (like any heating system) needs regular inspection and prevention. Installing pipes with water will cost more, and the pipes themselves, filters and pumps will pretty much empty your pocket. They heat these floors only when the heating boiler is turned on. Like ordinary wiring, the electric floor will last at least 50 years without requiring maintenance. If there is no temperature controller, then it is unprofitable to heat large floor planes with electricity. Electromagnetic radiation, although small, is present. 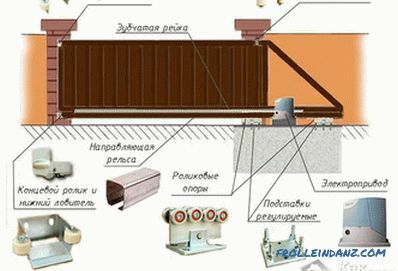 However, the use of a good shielding braid can minimize it (300 times less than the norm). Installation method Mounted under a concrete screed with a thickness of at least 3 cm. Mounted in a layer of tile adhesive or in the screed depends on the type of flooring. The film is laid directly under the coating. Types of flooring T. since. application of the screed is mandatory, then suitable for any coating. Tile, granite, wooden floor. Installation is possible under the laminate flooring, carpet, carpet, but you need a layer of screed at least 20 mm. Any floor covering, but if glue or screed is required for fixing the coating, it is necessary to put a layer of drywall on the film. Possibility of shaping the desired shape There are There are The film can be cut in 25 cm steps. To better understand the characteristics of each type of electric floor heating, we suggest watching the following video . To finally decide for yourself which heated floor is better to choose, First of all, it is necessary to carefully study the basis on which these floors will be laid. And then you can choose at random, and then with chagrin to find out that this heating system does not fit the existing base or conditions at all. Let's consider in advance some of the options that may be. If you have a new apartment or house, or you are doing a major overhaul, then there is no floor as such. In any case, in most cases this is the case. In a private house with an autonomous heating system, you can arrange a water-heated floor. In this apartment, in this case, the heating cables are installed. After the installation of a particular system, the entire base is filled with a cement-sand screed. Here it is best to use a mini mat system. On the old base roll out such a "mat" with heating cables hidden inside. 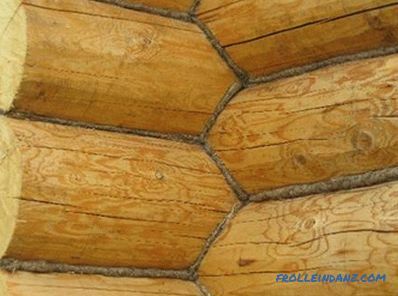 Having quickly connected it, it is possible to start laying of a decorative tiled covering. Laying tiles produced directly on the mini mats. Putting glue on mats for laying ceramic tiles. It is also possible in this case to install infrared heated floors. Having laid them on the base, you can immediately begin laying the material that is supposed to finish the floor. But under the tile it is not necessary to mount the infrared floor, as the glue will not stick to it. 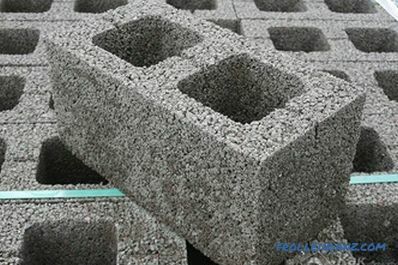 However, if there is a strong desire to do this, then use only the dry method and put sheets of gypsum board or glass-magnesium on the carbon film and then tile. 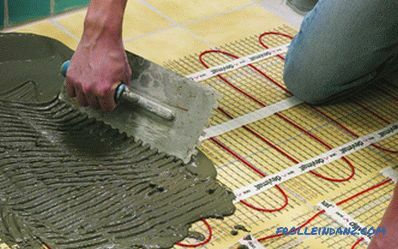 If you are wondering what kind of floor heating is better - cable or infrared, if you are going to lay one of these coatings, but pouring the screed is not supposed, Give preference to the second. For carpet and laminate with linoleum thin carbon film is the best option. Its thickness is only 0.3 millimeters, and only it warms up any of these materials perfectly. 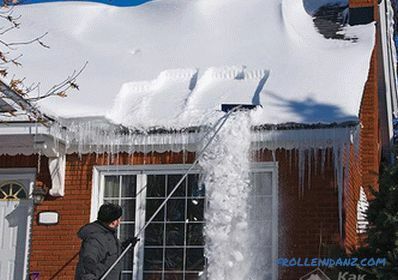 will be used When installing heated floors, it is usually immediately decided whether there will be some other source of heating in the house besides these floors. As a rule, the main heating system is already available (or planned), and heated floors are used to create additional comfort. However, more and more often a warm floor is chosen as the main heating system. Therefore, here you need to figure out what kind of floor heating system to use in this or that case. # 1. If the warm floor is only an addition to the main heating system. Here you can afford almost any of the above systems. Naturally, given the fact that different types of warm floors require the presence or absence of screed, as well as a certain floor covering. Well, and that the water system is only suitable for floor heating in a large private house with an autonomous heating system, we will not forget either. And the rest - the choice is unlimited. # 2. If the warm floor is the only source of heat in the frosty winter. In this case, an important thing to be remembered: the heated surface area of ​​the floor should be no less than seven-tenths of the total area. Only then will the house be warm. Assembling the heating cable section, you need to lay adjacent coils of the cable as close as possible to each other. So we will increase the specific power (calculated per square meter), respectively, and the heat output. It should be noted that the heating mats, which are rigidly assembled, initially have not very large power. Nothing can be done about it, so they are not suitable as the main source of heat. And deciding on which floor to choose as the main floor, in the direction of mini mats it is better not to even look. But infrared film, water floor or cables fit perfectly. In this case, in a private house with an autonomous heating system, it is best to stop on water-heated floors. 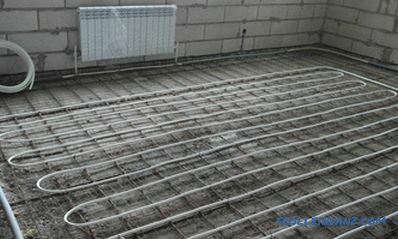 Their installation is carried out during the installation of the entire heating system of the house, after which the screed is poured and further finishing is done.